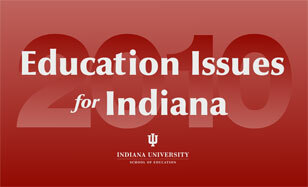 Media Advisory: recording of "Education Issues for Indiana 2010"
BLOOMINGTON, Ind. -- On Tuesday, Oct. 12, the Indiana University School of Education will record an education television program before a live audience of the Bloomington Rotary Club at the Indiana Memorial Union's Alumni Hall on the IU Bloomington campus. The program, titled "Education Issues for Indiana 2010," is a timely discussion of the most pressing issues facing students, parents, and educators in the Hoosier state, particularly heading into statewide referenda votes and the Indiana General Assembly's upcoming session. It will feature the perspectives of a teacher, administrator, business leader, education policy researcher, and dean of the state's largest school of education. The moderated discussion will touch on the issues voters must consider, what innovation business leaders hope for, how Indiana's schools compare nationally, what reforms teachers would like to see, and how new teachers should be prepared. The program will air on WTIU-TV, Indiana University's PBS television station, on Oct. 29 at 9:30 p.m. and is being offered to PBS affiliates throughout Indiana. Media are welcome to cover the taping on Tuesday. The taping will run from noon to 1:30 p.m. Below are more details regarding the program and panelists. WTIU, Oct. 29 at 9:30 p.m., other Indiana public broadcasting stations TBD; streaming of program made available at www.education.indiana.edu. Questions: contact Chuck Carney at ccarney@indiana.edu, 812-856-8027.